Consolidate and simplify managing all your secondary data and applications - backup, instantly recover, archive, file, build & analyze - on one platform. 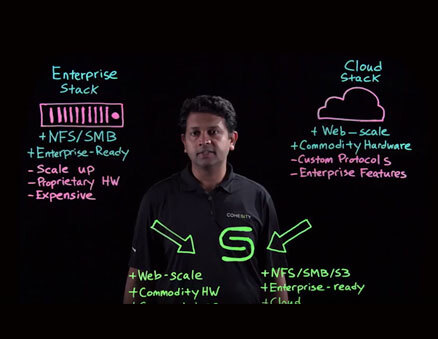 Single web-scale solution for on-premises, in the public cloud and edge. Radically simple management of all your secondary data and apps, located anywhere, through single global UI. Rapidly address your evolving business requirements on-premises or in any cloud with a software-defined solution. Reduce your data footprint with true global variable-length deduplication, compression and erasure coding. Stop the data sprawl. Converge your secondary data and apps on a single cloud-ready solution. Make your backup and unstructured data productive for rapid app development, compliance, security and analytics. Uniquely manages multiple workloads with NFS, SMB and S3 support, and sequential and random IOs on SpanFS. Instantly provision zero-cost clones with Cohesity SnapTree for test/dev. Eliminates unnecessary data copies. Meet compliance, security and analytics requirements by running Cohesity and 3rd party apps on DataPlatform. Simplify your data management and achieve operational efficiency with a web-scale solution. One software to run on your choice of certified appliances or the public cloud and remote/edge sites. Roll out policies, make upgrades and actively manage all locations and clusters from a single dashboard. Grow your cluster limitlessly on-premises or in the cloud with a flexible pay-as-you-grow model. Easily expand your cluster or perform rolling upgrades with zero impact or downtime. Automate by assigning policies to individual jobs and applications based on your SLA requirements. Maximize your cluster capacity on-premises, in the public cloud or edge locations and reduce cost. Choose between multiple compression algorithms, including Gzip, Snappy and Zstandard. Eliminate the need for unnecessary data copies to support multiple workloads. Be confident: Cohesity’s fault-tolerant system ensures data integrity under all conditions. Avoid “file-not-found” errors. Powered by SpanFS, DataPlatform offers strict consistency at scale. Two-node/two-disk failure tolerance support to ensure smooth business continuity. Protect your data with flexibility and space efficiency with erasure coding and replication factor. Simple and fast data and apps mobility into the public cloud of your choice. Easily extend to AWS Microsoft Azure, and Google Cloud, without a cloud gateways. Simplified data mobility and access in the pubic cloud without bringing it back on-premises. Modernize your long term retention by automatically archiving data into the public cloud. Cohesity DataPlatform helps you bring sprawling data and applications makes under control. 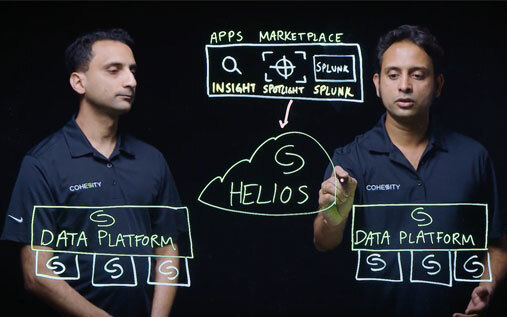 Much more than a passive dashboard, Cohesity Helios helps you manage of all your secondary data and applications wherever they reside —on-premises, in the public cloud, and edge. 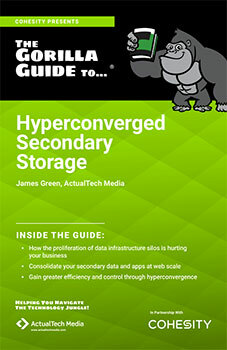 Hyperconverged Secondary Storage (HCSS) converges all secondary storage into a single solution, integrating the management of what had been individual silos of storage. As a unified solution, HCSS can achieve capacity efficiency that’s impossible when storage is broken out into isolated solutions. Cohesity has enabled us to greatly simplify and consolidate secondary workloads across our entire global operations, reducing our datacenter footprint, and creating efficiency across our IT infrastructure. Cohesity is a cut above all other solutions we researched and they provided a scale-out solution for simplified disaster recovery and application availability. 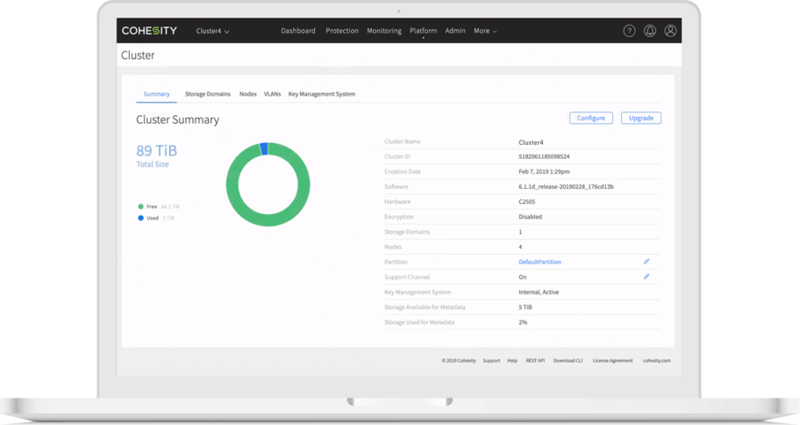 Cohesity has greatly simplified the entire process of managing and consolidating secondary data in a hybrid cloud environment.